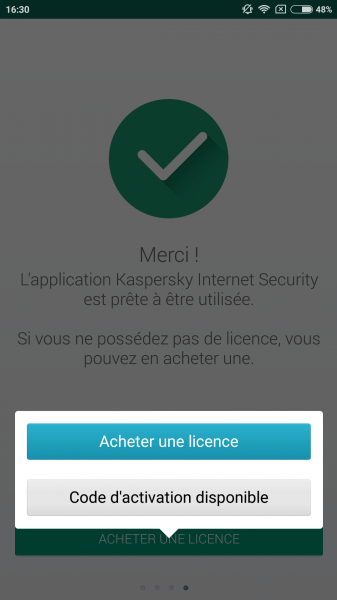 Kaspersky, which offered two Android applications, Kaspersky Mobile Security and Kaspersky Tablet Security, decided to combine them into a single solution called Kaspersky Internet Security as the PC version. It must be said that the editor has always produced effective solutions on the computer and that we expect high-flying performance on Android. 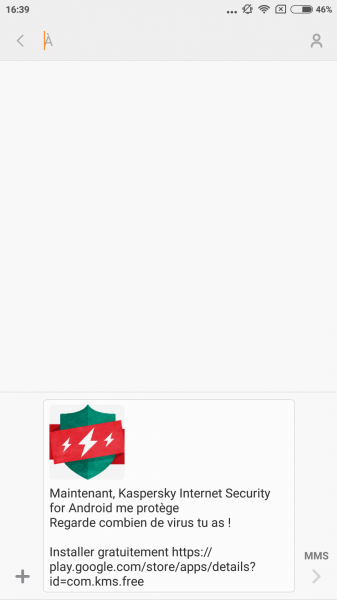 Let's see what Kaspersky has to offer us in this new package for mobiles and tablets. 1st screen: You choose your country and language of course. It is better not to make a mistake because the following screens are very well provided with more or less important information. 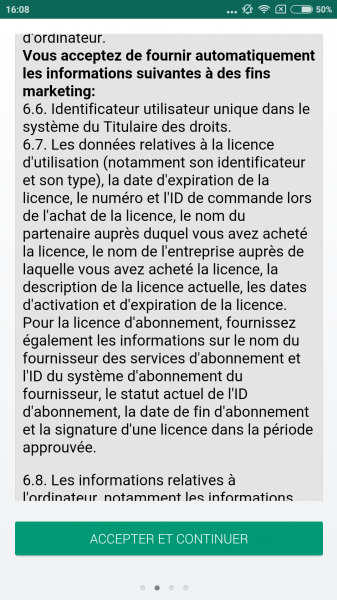 2nd screen: A long license agreement, which busy users will not bother to read. This document includes definitions, conditions of use of information on data processing, etc. 3rd screen: On the third configuration screen, kaspersky focuses on the My Kaspersky Portal, which it briefly presents. He invites us to create a My Kaspersky account to enjoy all the features, but you can choose to ignore it and come back to it later. What is obvious is the amount of information. Kaspersky wants to be transparent, which makes the registration a little longer. It's like being on a PC because there's so much information. In this respect, KIS stands out from most Android applications. In the end, the process is a little long but reassuring. Screen 4: That's it, the registration is finally complete. The last screen invites us to buy a license. Not necessary for the moment since the application is free for 31 days! We finally arrive on the home screen of the application which is updated automatically. a very complete help section. On the navigation side, you will notice that it is quite easy to navigate from one feature to another and access the various parameters of the application. These parameters are easily accessible and well detailed for each item. The Premium version is highlighted and marketing is omnipresent. Indeed, a sharing button has been integrated to invite the user to share by SMS, the download link of the application. This recommendation button even appears at the end of the analysis process that we will test later. Kaspersky Internet Security is very rich in explanations. As proof, the Help section is accessible via all the configuration screens. The user does not lack information, he is guided step by step. A very good point for novice and curious users. Let's put Kaspersky Internet Security on the table and see what the application has in store. So let's start with antivirus and real-time protection. To take advantage of it, you must buy the premium version. Yes, you have read it correctly, the application's nerve centre is not free! 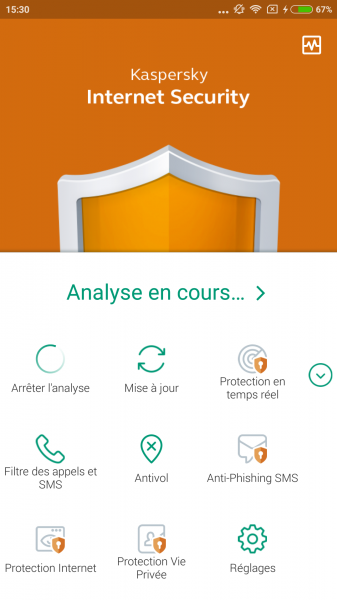 For nearly 15 euros a year, we start dreaming of an antivirus that can detect Windows viruses, so that our smartphones don't turn into bad malware vectors. Well, no, it's not for now! KIS Android didn't flinch when we presented them with a long list of PC malware. If you're the type to use your smartphone's storage memory to transfer everything and anything, so be careful. 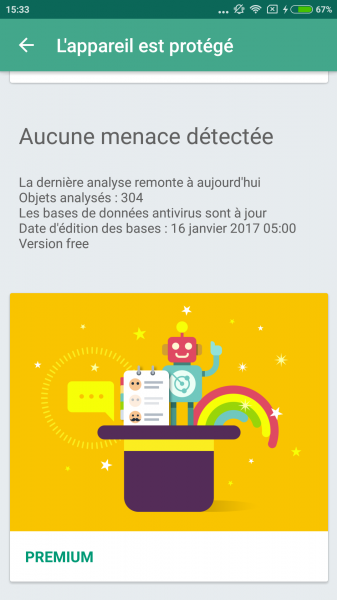 The fast scan that looks for malware in installed applications and takes less than a minute. The complete analysis that takes less than 2 minutes and will review all aircraft records. The analysis of a specific case. 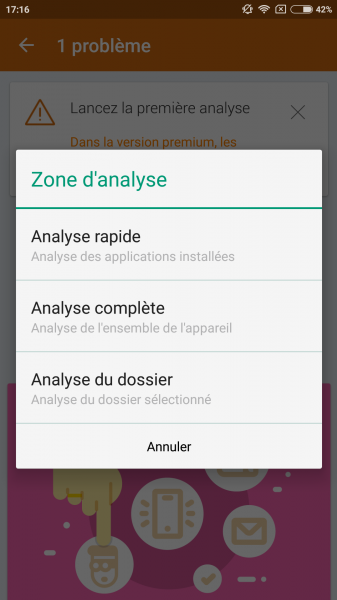 The first level of analysis did not reveal anything, however, an application that works with Airpush was installed. Airpush and its competitors are advertising agencies whose tools can be implemented in applications. 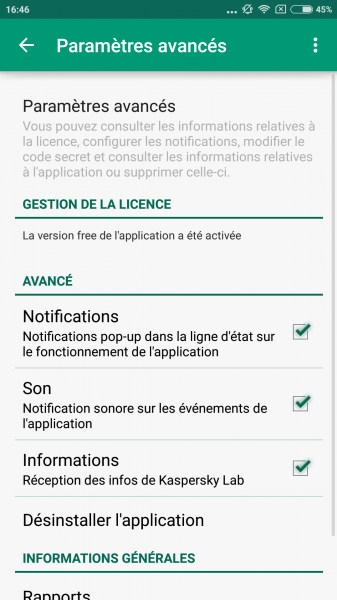 These applications will then invite you to download via invasive notifications, dozens of applications. Potentially undesirable but not necessarily malicious applications. To our great surprise, the complete analysis also revealed nothing. However, the maximum protection of KIS was activated. It took a folder scan for Kaspersky to quarantine all malicious files. As for web protection, we were able to download without any problem the same malicious applications detected during the specific analysis via Chrome or the native browser. Fortunately, web protection works against phishing. An antiphising device was also integrated into the SMS filtering but we were not able to test it. 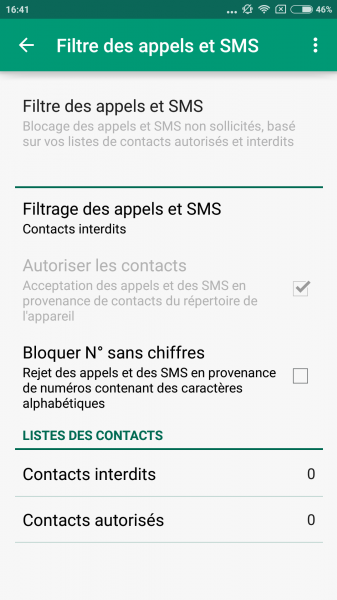 As for the privacy feature, it will allow you to hide certain contacts, your call history, and your SMS messages. Very useful in case of theft but no significant changes compared to the old version. The Anti-theft device has made us smile again. Note that it is not enabled by default. 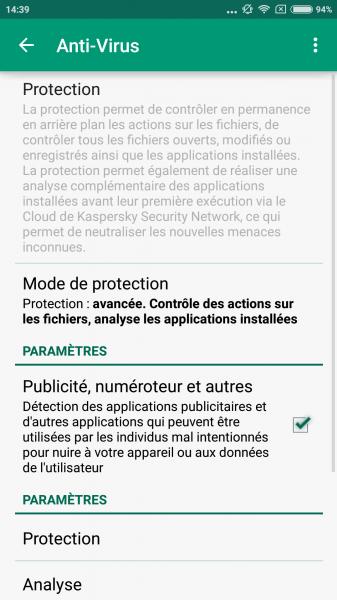 When it is activated, we observe once again Kaspersky's desire for transparency which indicates (again) the list of authorizations of the application. The anti-theft device can be easily configured via the phone and your My Kaspersky Portal account. The stealth photo option:It takes 5 pictures when you enter the password, to unlock the remotely locked device via My Portal. 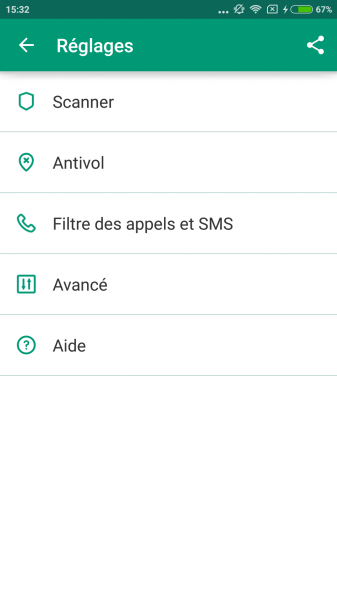 Very useful to identify the alleged thief or the person who recovered your device. Location: The phone is located very precisely in less than 10 seconds. The alarm, which works even when your smartphone is in silent mdoe. The application is very light as we pointed out at the beginning of the article, and this also affects performance. KIS is not very greedy and does not require much battery power. 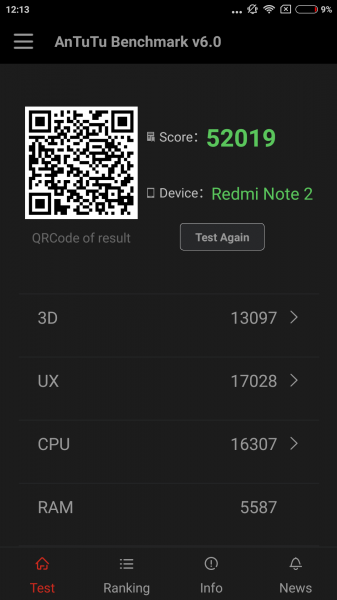 The device even gains a few points in the benchmark with KIS installed. Kaspersky Internet Security is one of the good antivirus solutions available today. The tests to which we have submitted it do not always reflect a normal use (we do not download 90 viruses every day) but it is still surprising that the application does not detect malicious APKs at the time of their download or in the first two types of analyses. 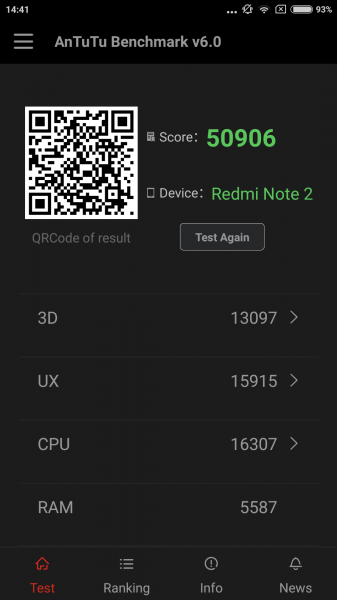 Is it a temporary bug or a compatibility problem with the software overlay of our test phone? We will know soon enough with the next updates. As with its competitors, it is mainly the peripheral functionalities that stand out from the crowd. Cis the only shadow on the picture. The anti-theft device is impressive in its precision and efficiency and there is also the possibility of planning your analyses. But for all this, every year, we will have to save €14.95.